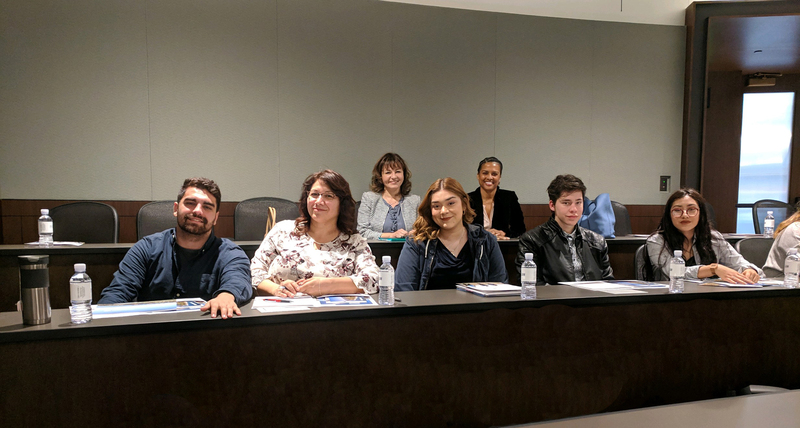 The Pathway to Law School students, along with students from other community colleges, attended Pepperdine Law School's Pre-Law Day on Friday. Students attended a first-year law class in contract law where they learned about the role public policy plays in the enforcement of contracts. They went on a campus tour of the library, and visited a courtroom for moot court practice, and had lunch while participating in a panel of faculty, current students, and admissions representatives to see what it's like to be a law student at Pepperdine. “The experience at Pepperdine Law was extremely enlightening,” said Transfer and Pathway Counselor/Coordinator, Tashini Walker. “During the tour by a law school student, perspective students were encouraged to keep their GPA strong and to take a preparatory course for the LSAT (Law School Admissions Test), which LAMC offers as part of the law pathway program,” said Walker. Admittance into the law school of a student's choice is dependent on GPA, and the student's score on the LSAT, said Sylvia Macias, assistant professor of law. Additionally, law schools are looking for people who represent our society with a wide degree of experiences and show demonstrated excellence in leadership roles or other endeavors. Although law school is expensive, all of the law schools in the Pathway program offer extensive financial aid packages, including merit based scholarships and grants that do not need to be repaid. Pepperdine's incoming President, Jim Gash, advised prospective law students that law school is not something they should contemplate lightly, unless you are serious about the study of law and becoming a lawyer. Speaking to the importance of lawyers in society, Gash told students that lawyers are "ministers of the broken", those that are arrested, the injured seeking compensation, families in distress, those whose homes are being foreclosed. "In every aspect of life, often the first person standing next to them is their lawyer," said Gash. "The law school 'experience' is like no other,” Macias, who coordinates the Pathway to Law School program, said. "For our students to observe a live, real, classroom situation is invaluable. It allows students to participate as if, as if they are already accepted into law school, as if they are part of the law school student body, and as if they are on their way to fulfilling their dream of becoming an attorney." L.A. Mission College was selected as one of 24 California community colleges to participate in the Pathway to Law School Initiative sponsored by the California State Bar Council and eight law schools, Pepperdine Law included, to enhance opportunities and advancement in the legal profession by community college students. Students interested in law school must register with the program, complete an orientation and complete courses defined in the program. Individual advisement is provided by Ms. Walker and the program coordinator, Professor Sylvia Macias. For more information about the program, please visit www.lamission.edu/law.